There are eight new models being released to the Harley-Davidson® family. Four of which will be available in two different motor sizes. All of the 2018 Softail® models will include an adjustable single rear mono shock, 107ci Milwaukee-Eight® motor (114ci optional on select bikes), Daymaker™ LED headlights, keyless ignition, four point docking hardware, and even a USB charging port. The new Softail® chassis was designed to be lighter and give the rider a stiffer and better handling ride. This new frame will reduce the weight on these new models by up to 35 pounds! The adjustable rear mono shock will allow the rider to simply reach under the seat and turn a knob to adjust the dampening of the suspension to a stiffer or softer ride. Now, as mentioned before, there are four models that will be available with the Milwaukee-Eight® 114ci motor. 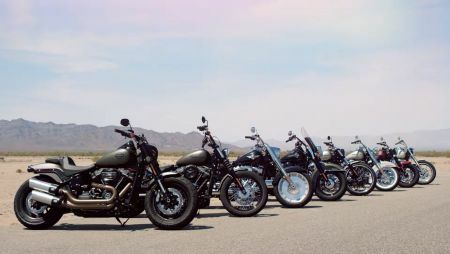 Those models include the Heritage Classic, the Breakout®, the Fatboy®, and the Fat Bob®. I don’t know about you, but there is one thing that comes to mind when I think about a Softail® with a Milwaukee-Eight® engine, and that is power-to-weight ratio! We’re talking about the same motors that blew the helmets off of touring bike and CVO™ riders in 2017, being jammed into bikes that weigh up to 200 lbs. less! Not only does the Milwaukee-Eight® provide you with more power, but it is also smoother and cooler than the Twin Cam motors. It features a counter balanced motor that reduces the vibration at idle and on the road. Less vibration means less fatigue, which ultimately leads to longer and more comfortable rides. The Deluxe will have LED turn signals to match well with the Daymaker™ front headlamps and provide the rider with better visibility going down the road. The Softail Slim® will now be 35 lbs. lighter, which will provide an even easier pick-up off of the kickstand. The new Milwaukee Eight® Softail Slim® will also provide deeper lean angles to previous year models. Finally, we have the three newest members to the Softail® family. With the Softail® Street Bob® you now have a 3.5 gallon gas tank, that when matched with the mini ape-hangers, really gives you an old school bobber feel. These changes are shaking the motorcycle community, and are a huge stride in the future of this sport. With the technology and design efforts put into these machines, there is plenty to be discussed. Don’t believe us? Come down and see them for yourself!